I always tell my students to make models before diving in and cutting the metal. Many seem to believe that it is some obscure form of torture invented by professors to make their lives more difficult. It's not. I am really glad I took my own advice today and made a model of my clasp before cutting up the silver. I am a bit of a pack-rat, so I grabbed some plastic I had pulled off of a day planner and cut out the first version (the plastic was handy because it was really close to the gauge of metal I would use, takes less time to cut, and was free). I wanted to check the scale and shape in relation to the overall piece. There was the added benefit of checking to see if the silk ribbon would fit through the hole. So I made a drawing and cut out the first version of the clasp. The scale and shape were okay but the ribbon stuck in the hole too tightly and looked awful. I went back and made a new drawing and cut out another sample. Same problem. The scale looked wrong on the third piece, because I shifted the proportions. After five samples, I finally arrived at a good balance of proportion and hole size. It would have been really expensive, if I had tried to cut it in silver first and encountered all these problems. Plus, I probably would have spent hours trying to file and adjust the size of the original before I gave up and cut a new one. And the moral of this story is... models, models, models! Now it is time to cut some silver clasps. Woo-hoo! P.S. The plastic dust is really itchy. I spent a good part of today sewing a silk ribbon to close a piece that I have been working on for well over a year. Given the rather limited demands that sewing a straight piece of fabric will put on the brain, mine was at liberty to muse extensively on the genesis of this piece and the reasons it has taken so very long to complete it. The piece began, as many do, as a hazy image in my head that I sketched out in one of my books (mind you, this is so long ago that I can't even figure out in which book I made that original sketch). Then came the collecting of materials; hours digging through beads and stones and pearls searching for the right combination of size, color, and texture. Then I began fabricating samples for the main collar which involved resolving structure and getting loops and groupings just right. Finally, fabrication. I spent hours crocheting the silver into a long band of gem and pearl encrusted loops. All along, in my head, the piece closed at the nape of the neck with a giant silk bow. I finished the silver collar and I was pretty well pleased with the look, weight and texture. But here, I faltered. A bow just was not a metalsmith's closure. A bow was certainly not a meaningful resolution of the issue of closing a piece. And so began the year of struggling and trying to come up with a proper jewelry solution. I made more sketches and drawings. I purchased a handful of carefully selected citrine cabochons. I set to work making the fanciest, most complicated slide clasp with moving parts and all, like a proper metalsmith. 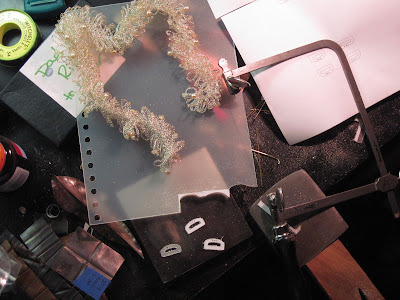 There were sketches and storyboards and extensive soldering, fitting, and planning. Unfortunately, the closer I got to finishing the clasp, the worse it looked with the piece. It just felt wrong. So I stuffed the clasp away in a drawer and went back to sketching. Nothing worked. Forged hooks, box clasps, various tricky catches and closures all fell short. Then the collar got tossed in a box and all but forgotten. I was never going to finish it. It was an utter failure. A few weeks ago I was cleaning my bench and I found the unfinished clasp with the citrine still waiting to be set. It was still wrong for the piece but, as I looked at the clasp, with all its inane and overwrought complications, I realized that the simple answer had been the right one all along. The silk bow. The piece had always been about the lusciousness and luxury of costly materials and rich textures. It desperately needed the sensual accent of the buttery, warm silk contrasting with the sparkling, crunching stones and metal. The soft swishing contrasts with the clink of citrines and pearls. The fabric becomes a focal point, given its scale in relation to the piece and the body. More importantly, it creates the sensual counterpoint to the metal and stones. The materiality of the piece gains depth through the contrast and the piece becomes a whole. And so, today, I made a bow. I finally got everything laid out and ready to shoot. There was lots of new work to be photographed. Lots of new work! I spent about 6 hours last night and this morning just taking pictures. Now it is time to sit down and edit the photos. You can see my little homemade light box sitting on my desk. 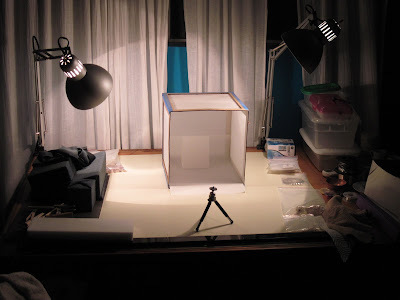 It is a pretty effective tool for shooting small work. I suppose that some day I will invest in actual floodlights but the desk lamps with reveal bulbs seem to work pretty well. I got bold and fiddled with some of the settings in my camera (you wouldn't think that requires boldness, right?). Well, it did. I played with the custom white-balance and using the spot metering. It really helped the images. There will be much less editing in this batch. Hooray! Shooo-wee! I feel like I have been staring at the computer all day. But, the website has images now. Go me! Except, I have to go back and caption all of them. I am really looking forward to finishing all of my web stuff so that I can get back out to my workbench. Of course, I can't really do anything until I tidy up the mess I made while getting ready for Urban Bazaar (I think that bench came with a top but I am afraid that I may find that all of those materials are actually levitating). Oh, and then I need to photograph all of the new pieces so that I can get them posted on Etsy. So, more computer stuff. I knew I went to architecture school for a reason...turns out that I mostly just learned how to use graphics programs really fast. Then, finally, I can get back to making jewelry. I have all of these ideas and components to work with. now I just need the bench time. But for tonight, I am going to cook dinner for my wonderful husband and friends. I know, some of you are now doing a double take and making sure it is actually me. Really, it's Anne. I am going to cook some things. I already made red wine marinade for the steaks and it took more than a pot and a pair of scissors (which is generally the extent of cooking utensils I will touch). I am going to make creamed spinach and roasted red potatoes for the sides and cut up some fresh cantaloupe for dessert. I am looking forward to this meal. It is nice to slow down and enjoy good food with the people who make life wonderful. P.S. I already looked up the number for poison control. Everything will be alright. I had a wonderful weekend. I participated in Urban Bazaar 10 in the Bishop Arts District; it was my first Art/Craft Fair. The Urban Bazaar is put on by the girls at Make and, can I just tell you, they are a really fun and supportive group of people to work with. They brought together around 60 local artists and crafters, plus live music and it was a blast. I got to see some fun and amazing work by other artists and I was pleasantly surprised by how friendly and supportive my fellow vendors were. It was really more a community than a competition. I am saving up for a craft apron from Mia Maria. She makes the cutest functional aprons in fabulous fabrics; I will be wearing that one constantly. It will help keep me organized and clean during class and studio time. Maybe I should get two. The clothes by Rewerked were beautiful. The artist recycles vintage clothing and fabrics into these airy contemporary-cut shirts and dresses. And over at Three Yellow Starfish, there were adorable baby clothes in a selection of fun prints. I loved the ruffled diaper covers, so cute. I really enjoyed chatting with the visitors to my booth. It was an intelligent group that appreciate and understand the love and labor that go into handmade art and craft. I was so grateful for all of the interest and positive feedback. It was a refreshing and encouraging experience, after being locked away in my studio for so long. I am definitely looking forward to doing more fairs. I have so many bits of pieces that need to be finished out. 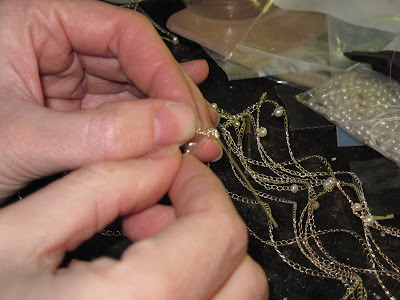 Today in my studio, I am listening to Pearl and The Beard and working on finishing out a twelve strand pearl and silver necklace. After this, I plan to start a batch of cleaning and then it is time to make some earwires. Hopefully, by the end of the day I can start tumbling some findings and finally finish some pieces. So I am putting away the spinach, as I am preparing my lunch, and I notice a puddle in front of the refrigerator. "Oh, no! The fridge must be broken," I think to myself. But wait, there is a bit on the little plastic grille at the bottom. Philip must have spilled some juice and not bothered to clean it up. Rude. Wait, no, we are out of juice. Okay, what is this mystery puddle? No suspicious containers in the refrigerator; well, regardless of its source, I have to clean it up. So I get the paper towels and start wiping. Goodness that is warm and smells like... peeeeee! Because the dogs weren't just outside ten minutes ago; clearly there was either a urinary emergency or someone was trying to take over the refrigerator territory. Oh, and Cameron is sitting in the corner looking GUILTY. I recently bought Foldforming by Charles Lewton-Brain and it has been incredibly inspiring. 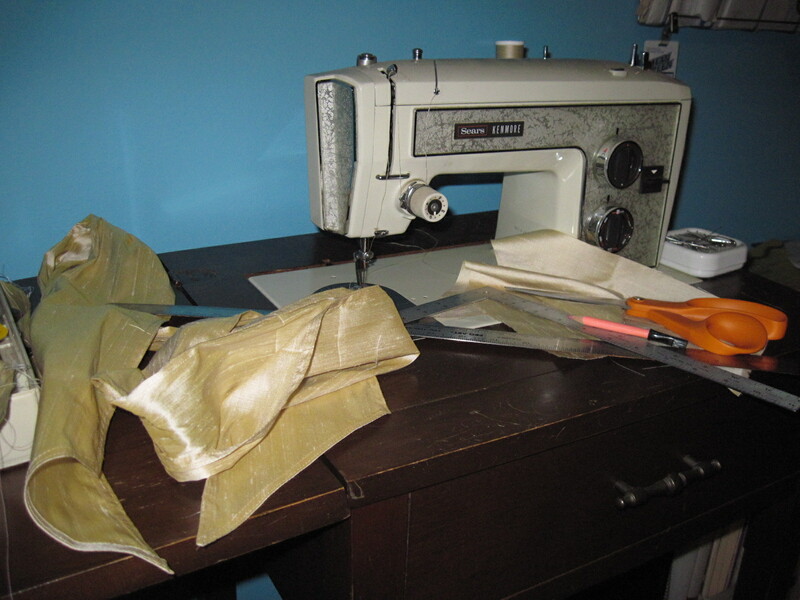 I have been busy making all sorts of samples in a wide variety of materials. The possibilities within line folds alone seem infinite. Over the Christmas break, I was commissioned to create a ring for a man. The ring was a replacement for a lost wedding band and I was given free reign, as far as design goes. I wanted to create something unique and masculine that highlighted the structure and properties of the metals. After exploring several design options, I decided to use some of the foldforming techniques I have been testing. 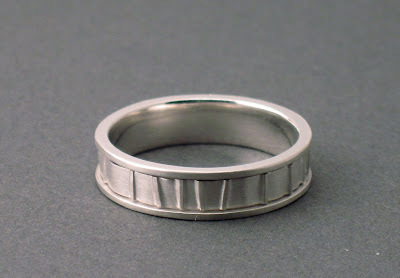 The final design is a structural band of sterling silver with an interior band of line-folded fine (pure) silver. 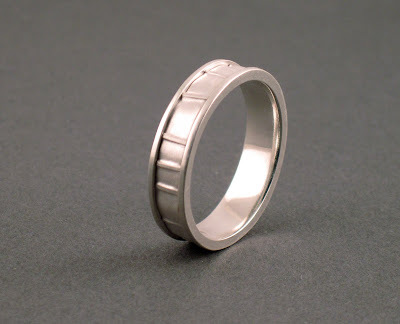 The folded band moves and spins independently of the sterling band. Over time, the sterling band will develop a dark patina and heighten the contrast of the fine and sterling silvers.